The eco-friendly student transportation alternative known as Green Operated Transit Carrying Humanity Around (GOTCHA) rides has found relative success on campus since its establishment late last October. “Both the university and student accessibility has been great in gaining more attention for the service on campus,” said Sean Flood, CEO of GOTCHA. According to Flood, the student participation was rather late in the fall semester, but in the spring, there has been a much better reception from students. The cars run from around 10 a.m. to 2 p.m. Monday through Friday, and 10 p.m. to 3 a.m. Wednesday through Saturday to help transport students who need rides. “GOTCHA is convenient and goes directly door-to-door. We just roll up to stops and see people and ask them if they need rides,” said fifth-year IE and BUS major Michael Roan, one of the student drivers for GOTCHA. According to Roan, the GOTCHA ride is an ecologically responsible alternative to student transportation when the buses and trolleys may not always take students where and when they want. Drivers are largely self-coordinated, and can work when they want and even text each other to work out times. Typically, these student drivers make $10-20 an hour, and between 150-300 students use the service daily. The cars also take students to popular areas three to five miles off campus such as Midtown, West Midtown, Atlantic Station and Home Park. Soon, the services will be extended to areas such as the Virginia Highlands. On campus, however, freshman hill, the CRC and various dorms are the most popular destinations. “Our goal right now is to increase the marketing initiative with the businesses that serve our main demographic: 18-34 year old students and the respective faculty/alumni. With the addition of a fast charger that will be installed soon we are anticipating being on the roads even more,” Roan said. Roan also says the main times drivers need to be out are at night, when there are more people to handle. A Facebook page also provides up to date information about when services will be available, as well as more information during special days, such as sporting events. Tech is now the fifth college campus to use the service. GOTCHA started off four years ago with Florida State University, then moved to other campuses such as University of Florida and Auburn, with headquarters right here in Atlanta. The company is looking to add to a few more campuses every semester, and hopes to reach about 40-45 campuses within the next three or so years. 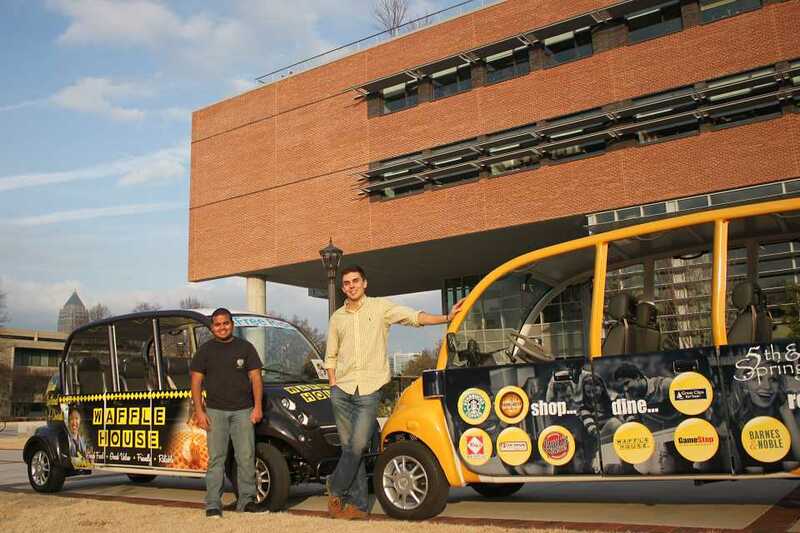 The electric cars were designed by the company GOTCHA and built in Shanghai, and are driven by 3-4 student drivers around Tech campus and to surrounding areas. The cars are charged to run for two hours and only on roads of 35 mph or less.